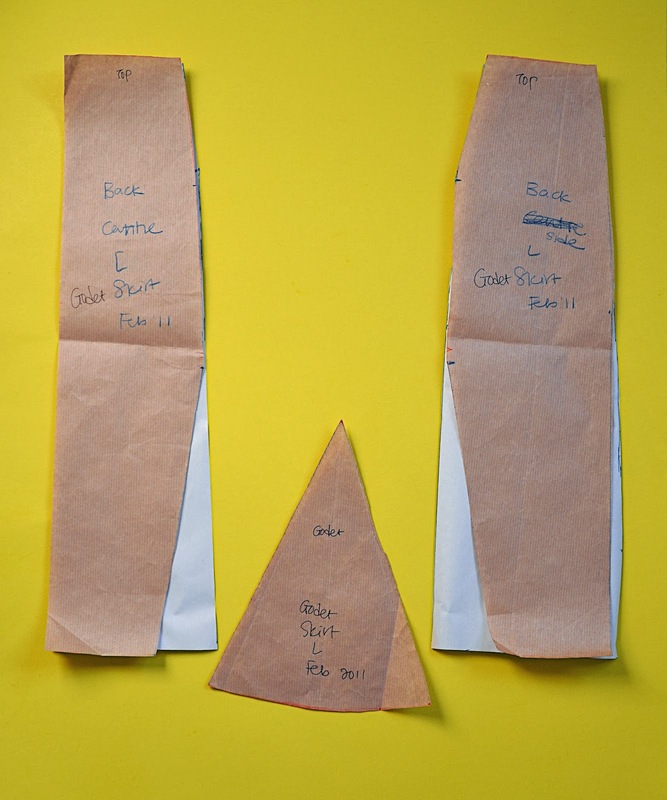 Today we are deconstructing the shaped panel skirt! 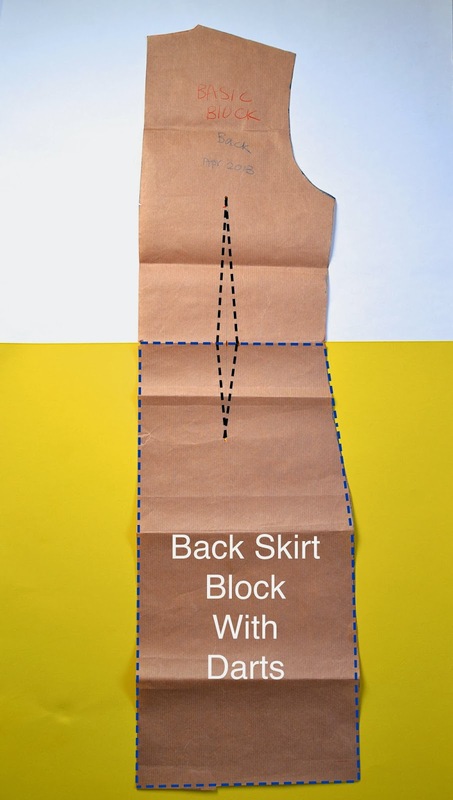 this is not a tutorial on how to draft a skirt block from your measurements. For that, try this tutorial (steps 13-18) and this tutorial (steps 13-26). if you've never sewn a tailored skirt before, you probably still won't know how to, at the end of this tutorial. 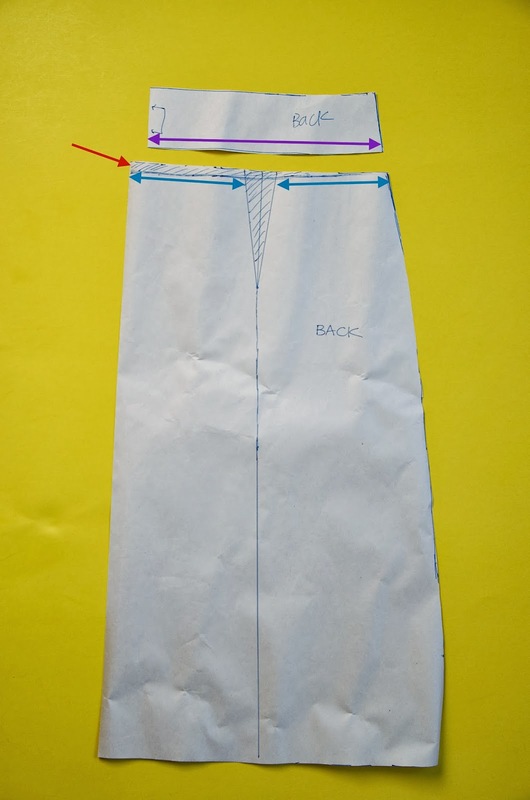 Let's start at the beginning - here is a classic skirt pattern. 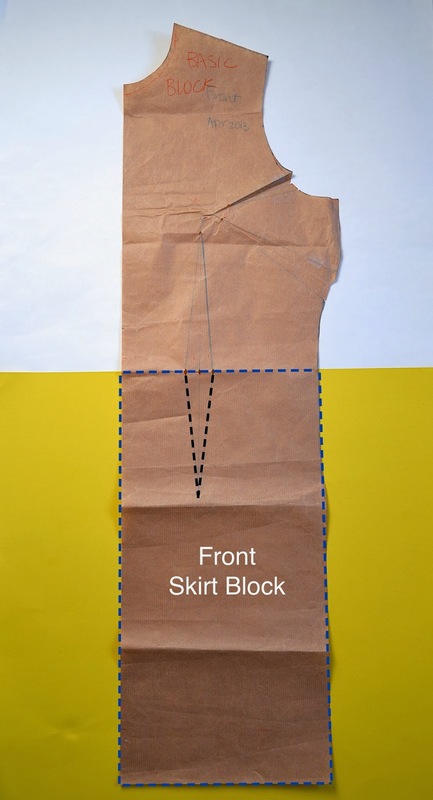 Usually, when I am drafting a new skirt design, I work directly from my original skirt block. Today, I am doing something insane and working with a skirt pattern instead of a skirt block. Reason: most of you will not have a skirt block as your starting point, because you are accustomed to working with commercial patterns. So I'm going to start where you would. First thing: As pointed out, these are not skirt blocks/slopers because they have design ease. Let me point out what that means. 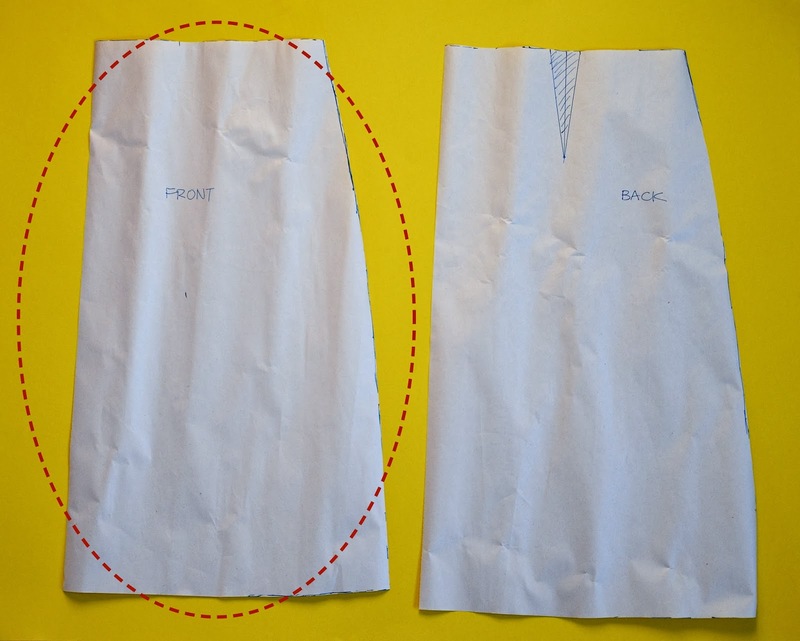 These are the front and back patterns of an A-line skirt. Their side seams slant outwards. Now see those dashed red lines? Those would have been the side seams for a skirt block, which would have fallen vertically from the hip (widest part of this particular set of lower body measurements). Second thing: A front skirt block would have a waist dart. Why? Because skirt blocks are the lower halves of full body blocks/slopers. Observe: this is my basic full body block/sloper below. 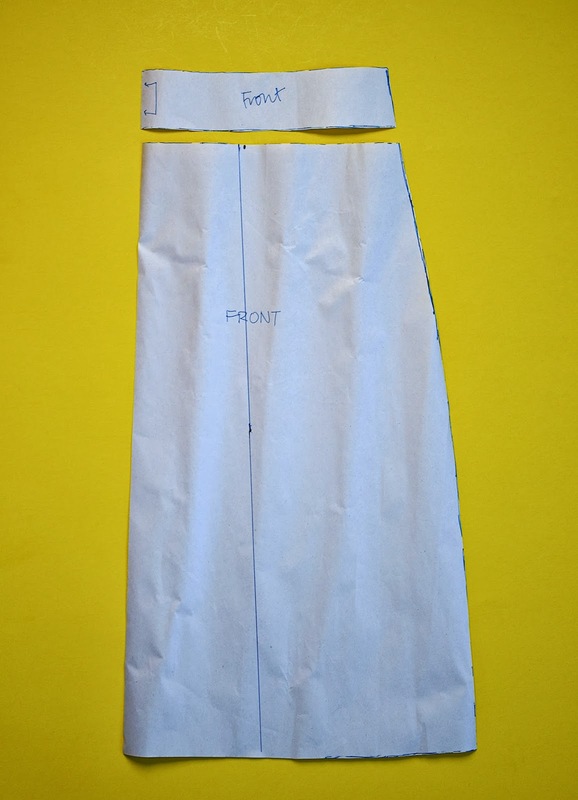 The lower part against the yellow background is the skirt block/sloper. Notice that the side of the skirt block falls vertically from the hip to the hem (typical of blocks, as we said in the earlier para) and doesn't slant out (more typical of patterns). Note also that there is practically no difference between my waist and hip dimension, which makes my skirt block sorta rectangular. Not everybody's skirt block is rectangular. Mine is, simply because my waist isn't the hourglass-neck thing it was before I had kids. Third thing: Where do you put that waist dart (see blue arrow with question mark two photos above)? We will come back to that later. Let's return to the Front skirt pattern now. the shape of your abdomen/waist/hip area. If you are more curvy or if you have a more pronounced abdomen, the difference between your front waist, front abdomen and front hip measurements might be significant. A waist dart would be useful in reducing the excess ease at the waist in addition to some side seam shaping. See this earlier post for more discussion. the design of the skirt. Some skirts (e.g. pencil skirts) are more fitted to the body, and the front waist dart helps to achieve this. Summary: no waist dart for LiEr's particular body because LiEr's body only requires very gentle waist shaping that is adequately achieved by a slant in the side seam. And the side seam slants in by exactly the same amount as the width of the waist dart. IF your pattern has a waist dart, where do you put it? I've been asked this question before, and many people say, "Oh, situate the two waist darts about (arbitrary number e.g. 8") apart" Um, no. There are NO arbitrary numbers in drafting. Every measurement translates to something on the human body. If you understand this, you will always know how to draft and what to draft and where to draft it. 1 Be continuous with the full-body sloper. Do you see? The waist dart of the skirt block is the lower half of the full waist dart that originates at the bust apex. This means that your waist dart separation is the same as the apex-to-apex distance of your bust. Common sense- if that waist dart separation it works for entire dresses, it will work for just the lower half of an entire dress aka a skirt. This principle still holds if you've got double waist darts. They're just a single big dart split into a pair of smaller darts, with each pair separated from the other pair by the bust apex-to-apex distance. 2 The shape of your abdomen. In some cases, the shape and/or size of your abdomen supersedes the bust apex thingy. For (overdramatic) example, if you are pregnant. Here, you might choose (yes, choose) to move the waist darts of your front skirt block to a separation that better accommodates the full shape of your belly. On to the back full-body block/sloper now. 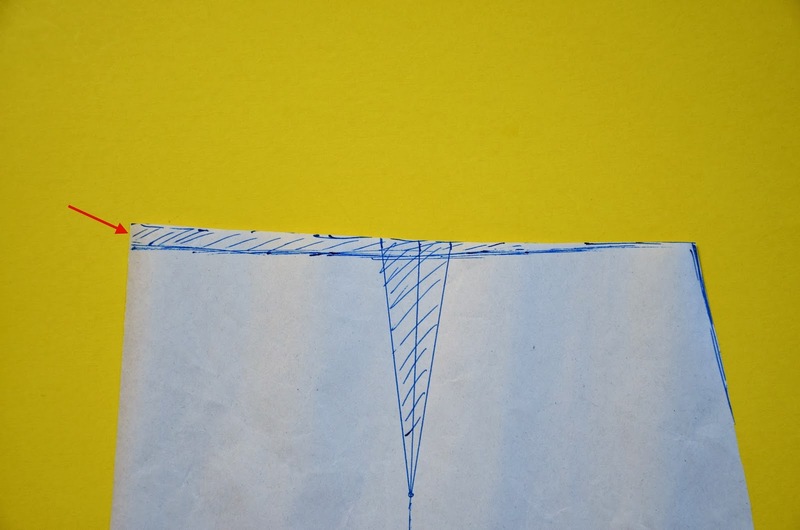 Again, the lower portion against the yellow background is the back skirt block/sloper. Now look at the back skirt pattern -this time, we're keeping that waist dart. But you just said... nnngggh!!! Why? Why? Why? Relax, people. This is because of that curve of the hollow of your back, that slants out to the top of the buttocks. Everyone's back is like this - slender people, well-endowed people, pregnant people etc. So there are are always waist darts in the back pattern of a tailored skirt, regardless of what the front pattern of your skirt looks like. 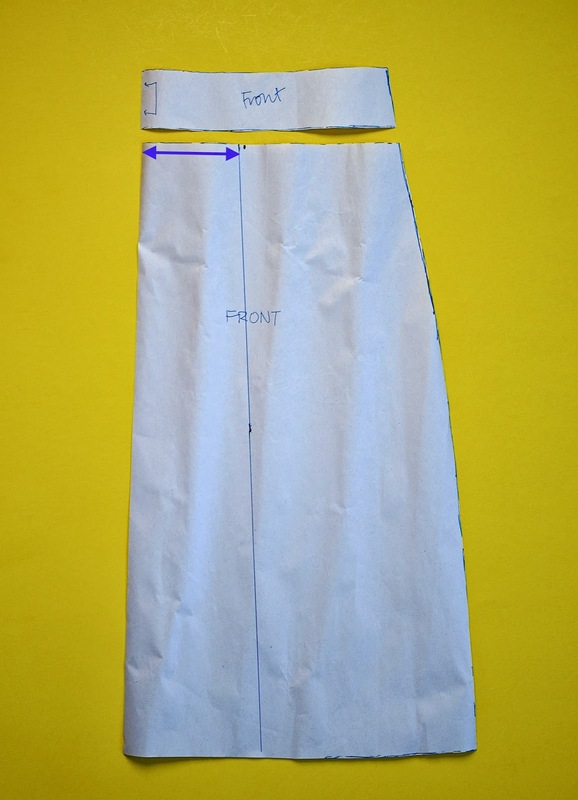 One more thing to do - remember that we got the skirt block from the bottom half of the full-body block by slicing off the top half at the waist. Which means that the waistline of the skirt is a straight line. And nobody's waist is a straight line from hip to hip - it's a gentle curve, with the hips a little higher than the abdomen. So we'll curve the top edge of the skirt block like so, then cut off and discard the shaded portion. 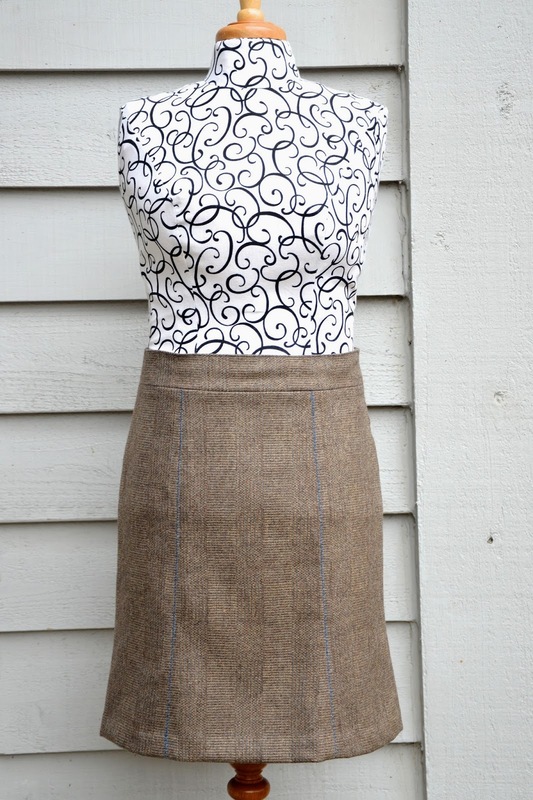 And we'll do the same thing for the front pattern of the skirt (no photos - too lazy). 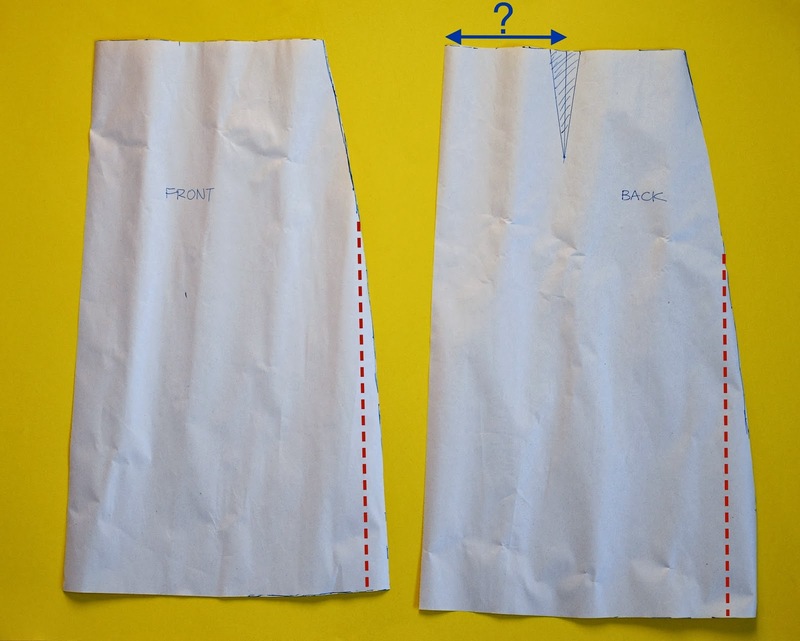 Q: I've seen skirt drafting tutorials in which this curve is drawn BUT by raising the hip point instead of slicing off the center waist. Is this the same thing? A: In principle, yes. In that case, you'd raise the waistline a teeny bit while in this case, you've lowered the waistline a teeny bit. I measure my waist-to-hip distance (which I call the hip level) along the side seam, and I don't like to change that by raising the hip point, so I slice off the waist towards the center front instead. The important thing, friends, is that your waistline is a curve, okay? Where you curve it is not a huge deal. You can always compensate with extra (or fewer) inches in your waistband. I want to show you a skirt I made some years back, whose back waistline I did not curve sufficiently - see that fold in the center back (purple arrow)? Think of that bit of waistline you need to slice off as a horizontal dart that would've taken care of that fold. I believe that in some drafting circles, this might be gleefully diagnosed as a sway back adjustment but really, it's not. It's just mathematics: a ruler-straight waistline is never a good fit for a curved hip. Depending on where on your body you've drafted the skirt's final waistline to sit, you might have planned for a waistband (or not). I did and I drafted my skirt, with its waistband, to sit below my natural waistline. Regardless of where your skirt (and its waistband) sits on your waist/hip region, the waistband, like the waistline of your skirt, MUST be curved. Never cut your waistband as a rectangle. Your waist/hip is not a cylinder that can be wrapped with a band like a dog collar. The waistband is curved in about the same arc as the waistline. I have no formula for you because I always draft mine by feel. 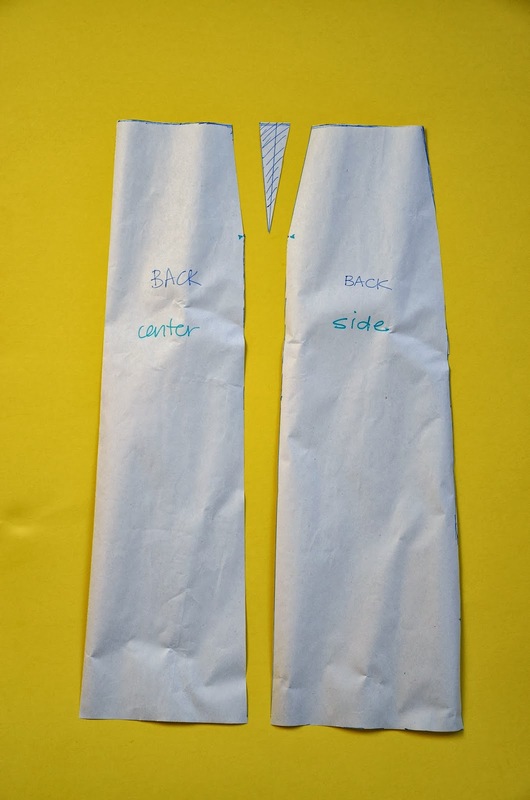 In fact, where possible, lay and cut the waistband (and its lining) on the bias of your fabric - it sits better on your waist and hip than if cut on the grain. Unless your fabric already has a lot of give or stretch or movement, in which case a bias-cut waistband would be all fluidy and spready in all the wrong ways. Then cut it on the grain. Let's look at the differences between front and back again. Notice that the back waistband looks narrower (purple arrow) than the width of the skirt's waistline, but only because of the dart. However, that purple arrow is exactly the sum of the two blue arrows, so that after you've sewn the waist dart closed, the two will match. And no, in case you were wondering, we do not extend the dart into the waistband. Waistbands don't have darts. In the front pattern, which has no waist dart, the waistband's width matches the skirt's waistline. All done! The skirt pattern, now an adjusted, independent spin-off from the full-body block is ready for adaptation! Did that feel like we spent too much time just getting to the starting line? Friends, if you want your skirt to rock its design, it needs to fit you well. Otherwise, it's going to look like you've tried to fancy up something that belonged on another person's body anyway. So yes, it's worth taking the time to get the fit just right in the waist and hip. And now, on to the second stage, which is the actual fun part! 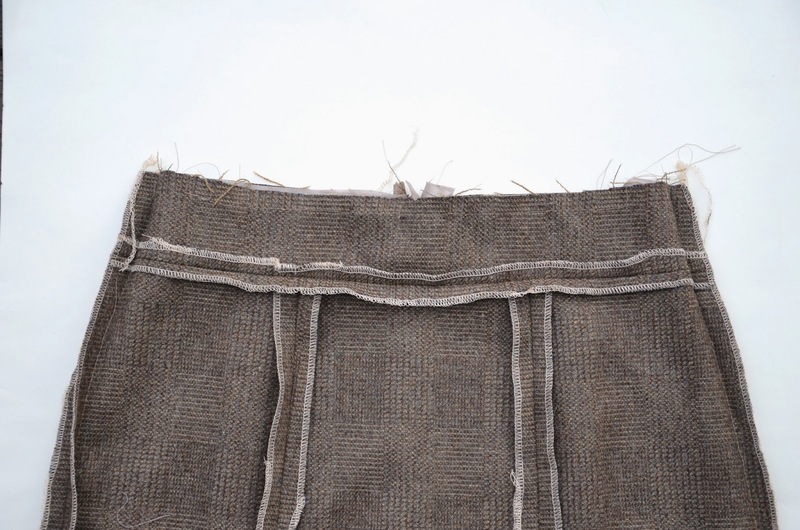 The most functional reason for a panel skirt design is shaping i.e. it isn't just for aesthetics or for patchwork or using up fabric scraps. Unless it is purely for aesthetic reasons (like princess seams in toddler outfits) every seam -or dart- exists to shape the fabric around a contour of the body. Many skirts have just two side seams and the curve of your hips is often shaped by these two side seams. 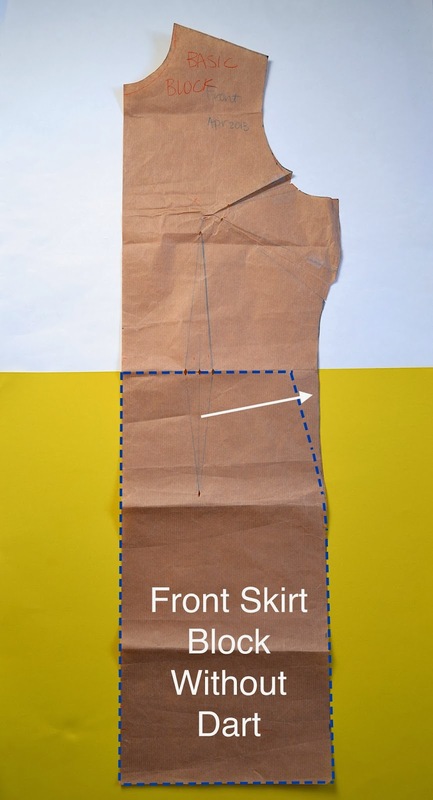 Sometimes a skirt also has a center back (or front) seam, into which a zipper is inserted, and more shaping can be done there as well. Panel skirts have multiple seams which, if desired, can be used to change the entire shape of the skirt quite dramatically. 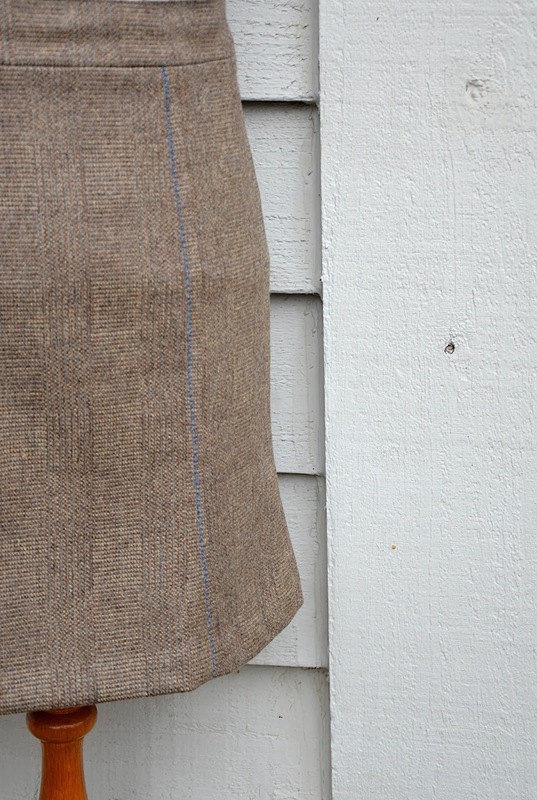 Our panel skirt today has 7 seams - two side seams, one back center seam, two front panel seams and two back panel seams. To make the back panel seams, we simply extend the center line of the dart and cut apart the pieces. Discard the triangular dart piece. You will sew that dart closed when you connect those panels again along that panel seam. This is exactly the same principle behind princess seams. 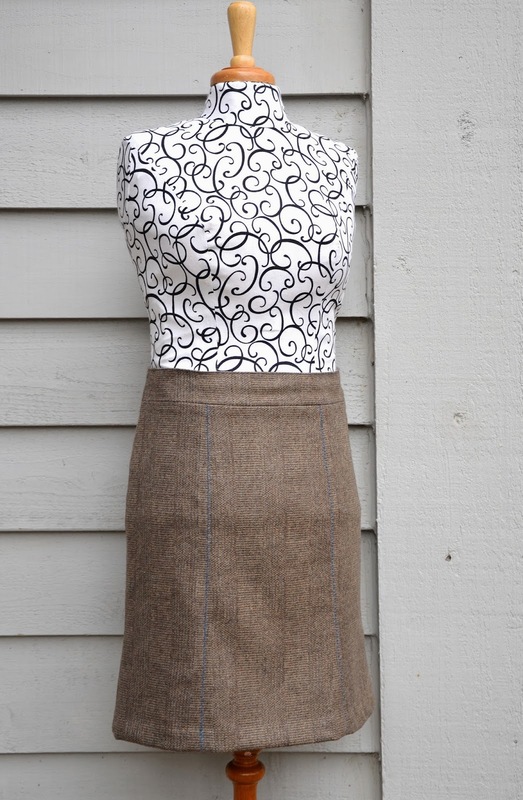 From the waist to the hip, we will leave the skirt pattern untouched; it already fits your waist and hips well. From the hip to the hem is where the magic happens. Left as is, you'll simply get a pencil skirt (if you'd used a skirt block with no design ease) or an Aline skirt like our earlier pattern. to get a skirt with a dramatic flare over the knees. Or, for a more subtle flare, just curve the seams themselves. Notice that you don't flare the center back seam, unless you want it to really hug your behind (and who does?). 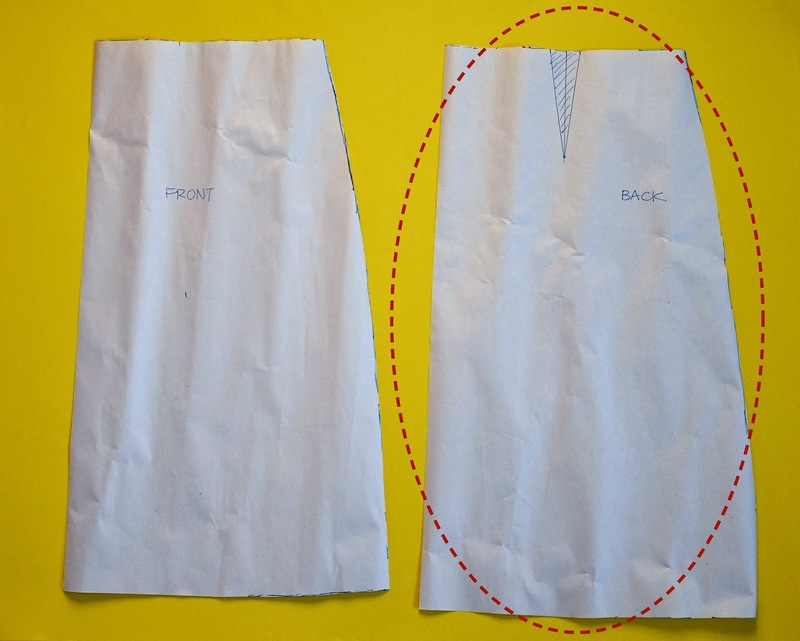 the brown layer is what happens if you use your A-line pattern and just introduce a little flare from about mid-thigh (red arrows) towards the hem. The skirt you'd get will be just that - flared from that point and overall shapeless because of the ease already in a trapezoidal A-line pattern. Not good. 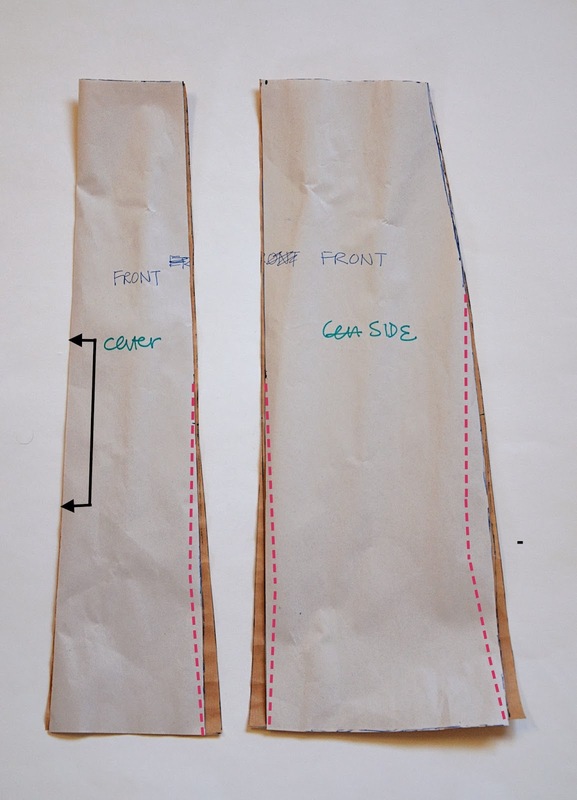 the white layer is what happens if you taper in the seams (green dashed lines for the panel seam and red dashed line for the side seam) before flaring to just the same width as the A-line's hem. You'd get a subtle curve that's much more becoming. and curve those seams. Again, we don't mess with the center front line because it's on the fold ; even if it weren't, you wouldn't want that seam hugging you any closer than it already does. It's funny what just that little flare - plus careful management of excess ease from the A-line pattern - does to the profile of this skirt. and then curves in below the hip before flaring out slightly (which shapes the region under the buttocks). 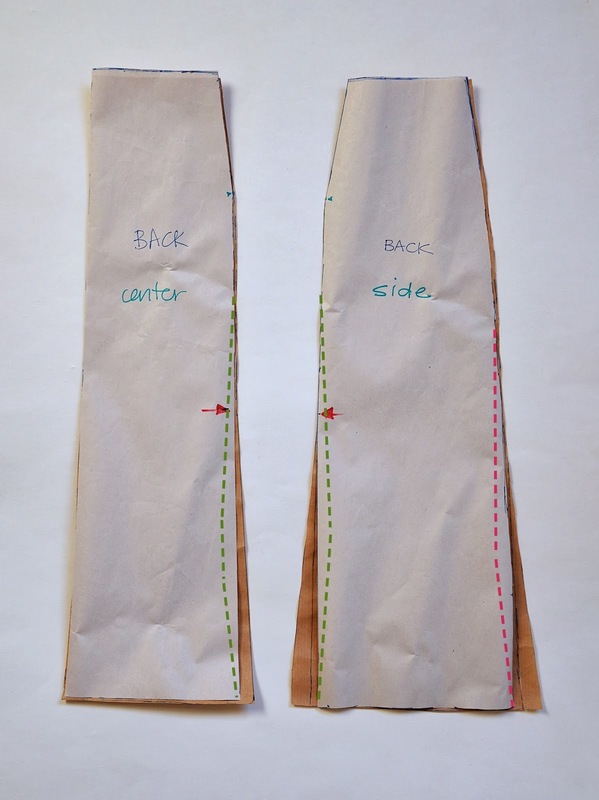 Some of you have asked questions about all kinds of related issues: fabrics to use, lining, construction, and so on. I think I'll leave that to another post. Now, go forth and sew panels, friends! And have a wonderful Thanksgiving! Perfect timing! I had seen a picture of a skirt with panels and was contemplating figuring out how to do change what I had to make it work. It was the darts which were stumping me a bit. Thank you! What a wonderful lesson, even for a beginner like myself to follow. Thank you! Thank you for this post ! You make it easy to understand. If you ever give a class, I want to be there ! Can I ask a question ? 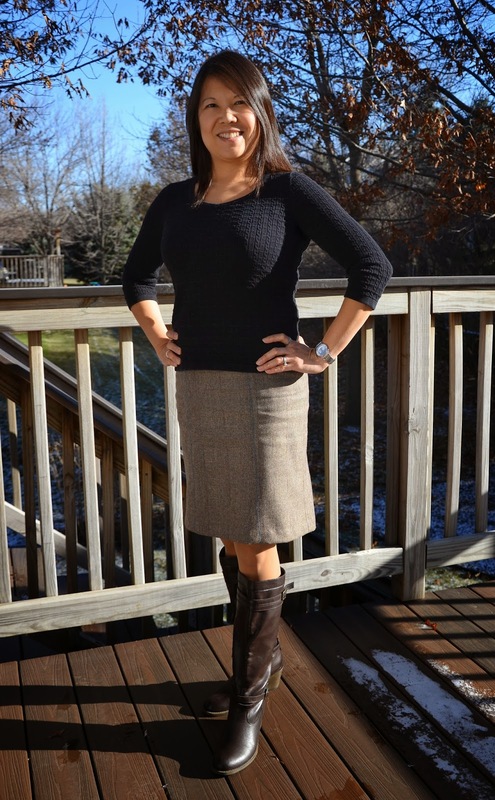 Would the same skirt work with a knit ? cecile: I'm going to say "yes", provided the knit is not drapey-flowy. Something like heavier like french terry might. Typical interlock/jersey would fall like a Tshirt and you may not get the curves to stand out. That said, you can also try denim, thicker corduroy (i.e. the sort you wouldn't make a shirt out of), linen, even some of the heavier cottons - generally any fabric that has a nice weight so that it hangs on your body rather than floats away. 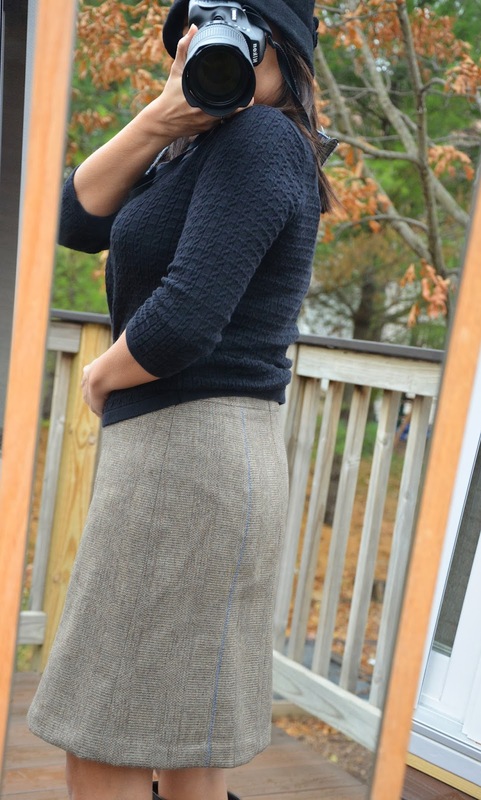 This skirt may be my favorite of the many you have made and shared here. Read through and am saving for when I can give it a go properly - after I complete your pattern drafting series. Which I'm planning as a new years resolution. Anna got a two-day toddler playschool spot starting next fall, so worst case scenario I can start then! Anonymous: it really is preference and design. 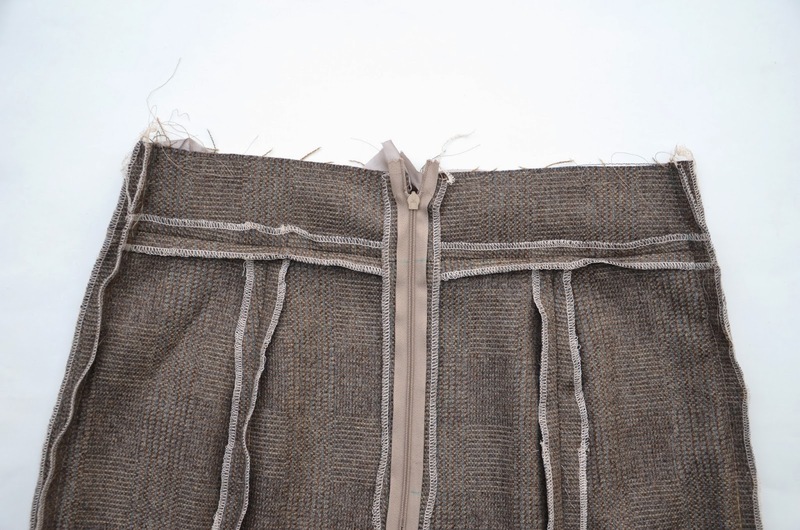 Some skirts are deliberately waist-band-less: the entire skirt is cut without a separate waistband - both the skirt and waist dart extend all the way up to the top edge of the garment. However, when you include a waistband, it is deliberately cut to shape the waist in a smooth, dartless way (otherwise you might as well just omit the separate waistband). So the dart stops before the waistband, to keep the waistband smooth. 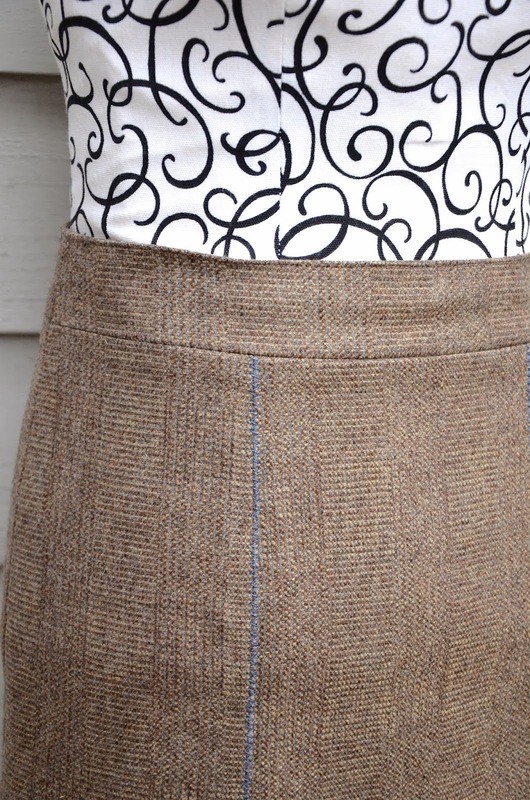 Also, the waistband is often cut on the bias, unlike the rest of the skirt (which is cut on the grain) - the bias layout allows the waistband to sit more comfortably on the curved waist. Yet another reason to have a separate waistband. Wow, thanks a lot for this answer! And what about closing the dart of the waistband in the pattern itself? Then the actual waistband would be smooth and dart-less. Could that be a way to draft the waistband? Yes, Elinor - we always close the portion of the dart that's within the waistband, so the waistband is smooth and dartless. The resulting waistband piece is a little more curved as a result, and shorter than the width of the top of the rest of the skirt (which still has the open dart drafted in).